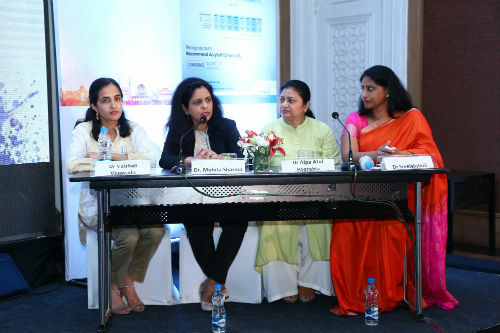 Hyderabad: Over150 women ophthalmologists from all over India congregated in Hyderabad at Women Surgeon’s Summit 2018 to discuss the future of modern eye care. The event was held by Women Ophthalmologists Society (WOS) in association with Alcon, the global leader in eye care and a division of Novartis at Hotel ITC Kakatiya over two days and was attended by top women ophthalmologists like Dr. Sreelakshmi Nimmagadda, Dr. Mohita Sharma, Dr. Niveditha Narayanan, Dr. Namrata Sharma, Dr. Sujatha Mohan, Dr. Nita Shah, amongst others.The guest speaker at the event wasArunima Sinha, the first Indian amputee mountaineer to climb Mount Everest. a new level of safety and precision. This technology allows ‘automated’ creation of the opening around the eye’s lens and softens the cataract for a safer removal. 3D imaging is integrated with the Laser, which allows greater precision. Another advantage is that the laser helps to ensure better centering of the implanted lens. Other topics that were discussed were the Bladeless Lasik surgery, modern eye care solutions and lens options for every patient, synergy between technique and technology, the journey from quantity to quality of vision, visual quality post refractive surgery, etc.